If you max out your risk on every trade then you will lose your account some day, it is inevitable. The amount you should risk on every trade can be mathematically determined using game theory to give you the highest possible return. For example: If your winning percentage is 60% and your risk/reward is 1.5:1 then your maximum per trade risk should be 20%. At 20% you will get the maximum return on your money once losses are factored in. If you risk more than that, the losses will set you back too far and you will waste too much money regaining your losses. If you risk less, your return will be less. The Kelly strategy will make your returns more volatile when compared to a constant dollar approach. 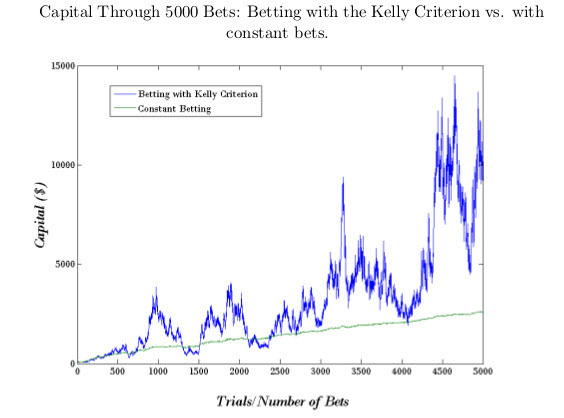 It was invented by Dr. J. L. Kelly of Bell Laboratories in 1956: … the maximum rate that earnings may be made over the long term of a series of gambles when the probabilities of winning and losing are well known. Most traders would find the volatility of a maximum Kelly percentage too emotionally stressful so a compromise approach will make you sleep better at night: fractional Kelly. Most people who use fractional Kelly agree that 20-25% of Kelly is best. In the above example a stop loss of 4% of your entire account balance would be 20% of Kelly. Keep in mind that Kelly is only valid when “...the probabilities of winning and losing are well known” so play it conservative until you have good data. You should also note that probability of ruin is not zero if you go with 100% Kelly. If you are new to trading or for some other reason you don’t have an accurate trading history then you should keep your trades small until you have established your track record. If your track record is poor then paper trade until it gets better. If you are holding your trades overnight and the investment you are trading does not trade overnight then the risk is much higher because the investment might gap down when it opens if there is bad news. I know a guy who put his wedding money in one trade and the next morning the stock was cut in half by bad news about accounting irregularities and the CFO resigning. His fiancé was pretty unhappy. As a general rule, your stop loss should be no more than the fractional Kelly amount and the total trade size is not more than the full Kelly amount. Let’s look at an example: If your winning percentage is 60% and your risk/reward is 1.5:1 then the formula would be .2 = 1.5*(0.6-0.4)/1.5 or 20%. I like to use a fractional value of 20%-25%. So if you have a $5,000 account with 60% winners and a 1.5 risk/reward ratio then your Kelly value would be $1,000. Multiply $1,000 by the fractional value of 20-25% then you get $200-250. Therefore $200-250 is your maximum stop loss for the entire trade. Do not enter a trade unless you can use a $200-250 stop loss on the entire trade, you have a profit target of $300-375, and your winning record is about 60%.